The dental implant specialists at Edgewater Dental Group offer a better alternative to traditional dentures with competitively priced implant dentures, including all-on-four implants. If you live in or around the Edgewater, Rogers Park, and Andersonville areas of Chicago, call or book an appointment online to find out if implant-supported dentures are right for you. An implant-supported denture is a special type of denture that anchors to dental implants instead of resting on your gums like a regular denture. Dental implants are titanium rods that your Edgewater Dental Group dentist surgically anchors into your jaw bone. When the bone heals, they place an artificial tooth on top of the rod. Your dentist may recommend an implant-supported denture if you are missing your teeth but have enough bone in your jaw to support dental implants. In addition to standard implant-supported dentures, the team at Edgewater Dental Group offer all-on-four implants at competitive pricing. All-on-four implants are the latest development in complete smile restoration. Using this technique, your dentist replaces all your natural teeth with a removable denture that attaches to only four dental implants. Dental implant technology has come a long way since it was first introduced over 50 years ago. 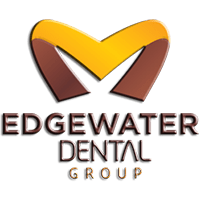 The team of dentists at Edgewater Dental Group stay current on the latest techniques and state-of-the-art equipment to ensure you’re happy with your smile. Instead of using a separate implant to replace each individual tooth, they use 3D imaging and specialized computer software to expertly place four dental implants into your jaw bone. Then, they make a customized denture to attach to the four implants. What should I expect when I get all-on-four dental implants? First, your dentist performs a dental exam and discusses whether all-on-four implants are the best solution for you. Then, they take 3D digital impressions of your mouth and create a customized treatment plan. Before surgery, the dentist numbs your jaw with a local anesthetic. Depending on your needs, they may also offer gentle sedation to help you relax throughout the procedure. Due to modern technological advances, the surgery itself only takes a few minutes. Afterward, your dentist places a temporary denture over the implants while your jaw heals. A few months later, you return so they can attach the permanent denture. With competitively priced all-on-four or implant-supported dentures, you can have a brand new smile without the shifting and discomfort of regular dentures. If you’re looking for a better alternative to standard dentures, call Edgewater Dental Group or schedule an appointment online today.